My cross-stitch project free time is over. 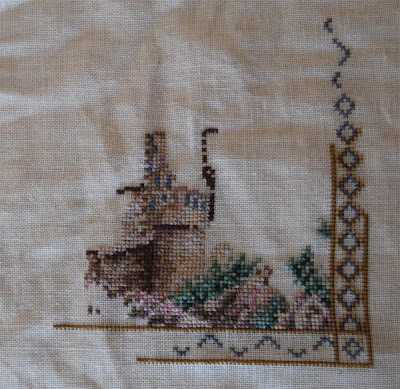 Castle Sampler by Teresa Wentzler. I've noticed that there are as many different ways to start this as there are stitchers. Many do the outer frame first, then work their way inwards. Some (like me) start at the very center, then work there way outwards. I decided to start with the castle first, simply because I have the feeling this is going the be the most painful part - more blends than there are letters in the alphabet and not a single stitch next to a stitch of the same color anywhere. Confetti at it's best. Well, I have to see where my mood carries me. Eulentischdecke (German magazine pattern). I've made a few changes to the pattern before I started in order to make it fit the table cloth I've got (spread the owls a bit more apart and also added two owls inbetween). King Tut came back from the framer. Need to make a picture as soon as he's up on the wall. 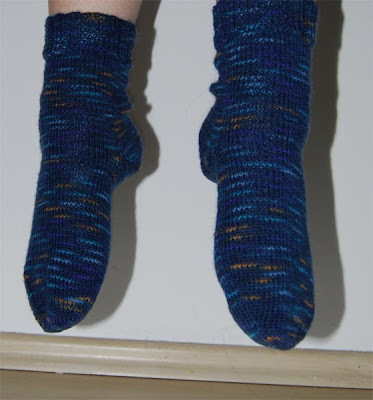 I also finished a long time strangler - a pair of socks. 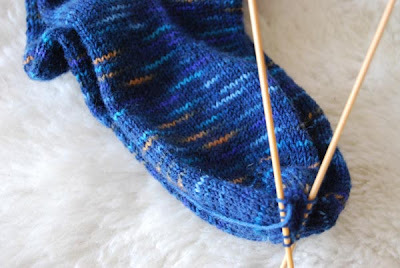 A very basic sock pattern, 2x2 rip for the cuff, short row heel, the rest plain stockinett. On the reading front, I've stopped with Friday Night Knitting Club as well as with the Charlie Bone book - both, for some reason, couldn't keep my interest any more. The Knitting Club book wasn't really what I expected - it was more about yuppy women in New York and their endless relationships. Just not something I'm that interested in. With the Charlie Bone book - don't know why it didn't work for me. I liked the first one well enough. 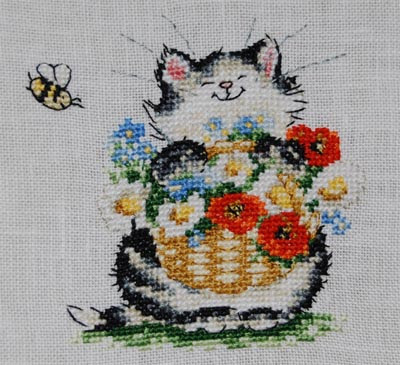 I'm still cross stitch project less - though not for much longer, I think. For my travel project I've decided on a table cloth with owls. The pattern (well, at least the basic) is from a German magazine (Lena 9/04). It's a row of funny looking owls sitting on a long branch. As the table cloth I've got is a little bit bigger then the one the pattern called for, I've modified the pattern a little. I think it will turn out quite cute. I'll keep you updated. As I didn't have anything to stitch last week, I've went back to the lizard ridge blanket from Knitty. 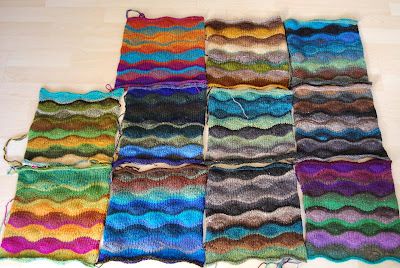 My plan is to buy a couple of skeins of Noro any time I've get a special business trip or some crazy work project (which I am in the middle of right now). I did have about 6 skeins left from the last such event and finally got around knitting them up. This is going to be a very colorful blanky. 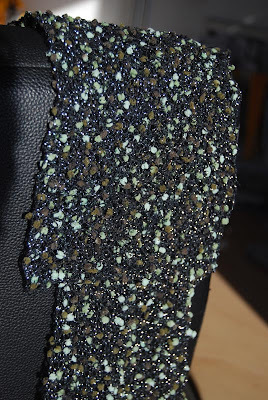 I've also decided that the green/black/silver scarf from the wool I've got in Japan is long enough and bound it of. The picture gives no idea on how glittery the thing is thanks to the metallic thread in the wool. Sorry, for not posting on Sunday. A) I was working on Sunday and came home at 9PM and was not in the mood to fire the computer up. B) nothing to show really, at least not at this point. 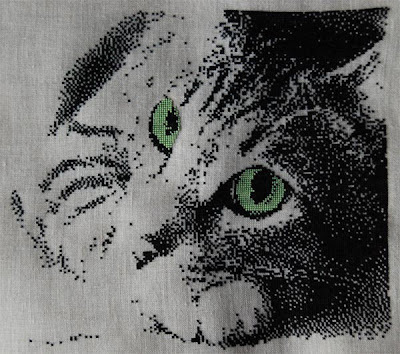 The pattern is 'It's All in the Eyes - Cats: Mr. Zachary' by Ronnie Rowe Designs. I've stitched it on a 40ct linen with one thread of DMC 310, so the stitches are really tiny. The eyes in the original pattern were yellow, but I liked the green better - more cat like, so to speak. This was my travelling project. I thought it interesting how for the longest time you couldn't make anything out, and then *whomp* there was a cat. Calender Cats - July, by Margaret Sherry. A very cute and fun little in between stitch. I'm going to make this into a birthday card. For some strange reasons it also feeds me Transformers obsession - black and white cat --> Barricade (though this is not any expression I would ever think to see on Cade's face) and a little Bumblebee as an added bonus. So, nothing else to stitch, all WiPs finished. I'm freeeeeeee!!! Maybe I could finally finish the two scarves and the one pair of socks I've got to do. Or give two single socks finally some partners. Or start to put together everything for The Castle Sampler by TW. I've already decided on the fabric, so all I need is to pull out the threads. Or start something totally different.